These room darkening sheer shades are made of a durable nylon and polyester blend they give you the sheer look you desire but are durable and tough. 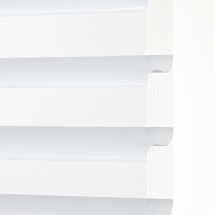 Easy up operation and excellent tilt control make this a versatile blind for your windows. Available in a wide range of colors to coordinate with our light filtering soft sheer horizontals. Excellent sheer shades to darken your bedroom but still allows for a full view out your windows! Leave the vanes open while raising the shades! Chalet soft sheers will have a gap between the blind and the inside edge of you window. This gap will be up to 1/2 inches wide. This is due to the way the shade is manufactured and is not a defect. 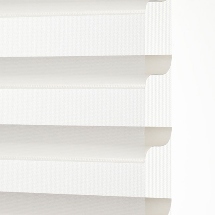 For general use this gap DOES NOT affect your blinds privacy ability, however it is Not eligible for warranty return. W: 12" 13" 14" 15" 16" 17" 18" 19" 20" 21" 22" 23" 24" 25" 26" 27" 28" 29" 30" 31" 32" 33" 34" 35" 36" 37" 38" 39" 40" 41" 42" 43" 44" 45" 46" 47" 48" 49" 50" 51" 52" 53" 54" 55" 56" 57" 58" 59" 60" 61" 62" 63" 64" 65" 66" 67" 68" 69" 70" 71" 72" 73" 74" 75" 76" 77" 78" 79" 80" 81" 82" 83" 84" 85" 86" 87" 88" 89" 90" 91" 92" 93" 94" 95" 96" 0/0"1/8"1/4"3/8"1/2"5/8"3/4"7/8" H: 12" 13" 14" 15" 16" 17" 18" 19" 20" 21" 22" 23" 24" 25" 26" 27" 28" 29" 30" 31" 32" 33" 34" 35" 36" 37" 38" 39" 40" 41" 42" 43" 44" 45" 46" 47" 48" 49" 50" 51" 52" 53" 54" 55" 56" 57" 58" 59" 60" 61" 62" 63" 64" 65" 66" 67" 68" 69" 70" 71" 72" 73" 74" 75" 76" 77" 78" 79" 80" 81" 82" 83" 84" 85" 86" 87" 88" 89" 90" 91" 92" 93" 94" 95" 96" 97" 98" 99" 100" 101" 102" 103" 104" 105" 106" 107" 108" 109" 110" 111" 112" 113" 114" 115" 116" 117" 118" 119" 120" 121" 122" 123" 124" 125" 126" 127" 128" 129" 130" 131" 132" 0/0"1/8"1/4"3/8"1/2"5/8"3/4"7/8"
The were cut to perfection, great quality. The were cut to perfection, great quality. I wish they would darken the room more but that isn't Blinds Chalet's fault. Love the options and overall turn around time for delivery. I would recommend Blinds Chalet to anyone. I purchased these blinds for my home and they are perfect. I purchased these blinds for my home and they are perfect. I live in an area where you need privacy as the homes are so close together, These shades are just perfect and fit perfectly! Have not yet hung this shade it is for a condo in the mountains and I have not had a chance to get up there.Hopefully I will be going up within the next couple of weeks. The service was excellent and the blinds arrived in a timely manner. The service was excellent and the blinds arrived in a timely manner. The only observation I have is I expected Room Darkening Shades and even when closed all the way it is still very light in the room. I was expecting Motel or Hotel room darkening and instead it is light filtering shades. They are still very pretty on the windows.